This is the latest of the pop-up restaurants in Brixton Market. Already with a location in Shoreditch, their experience in the restaurant business is clear, with the place running smoothly although only just opened. 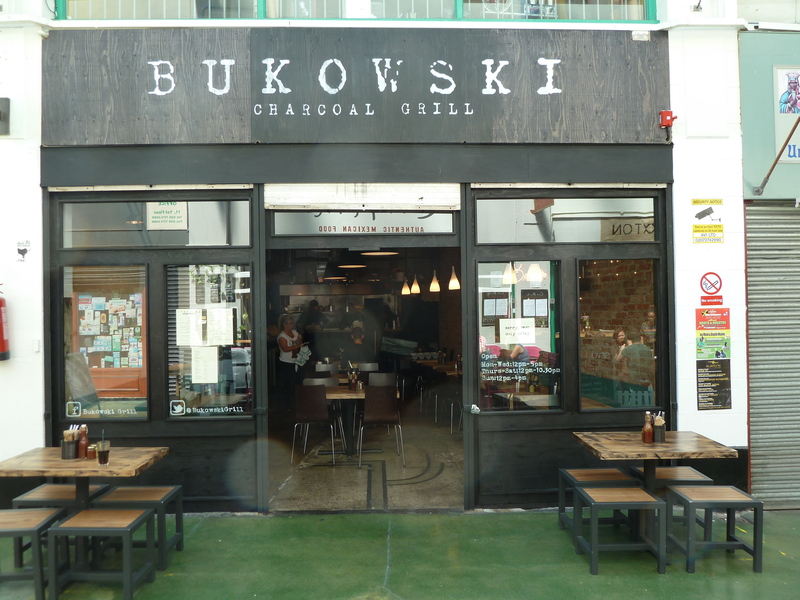 It is in the heart of Market Row, which nowadays seems to have restaurant after restaurant popping up each week, making it almost seem like a food court rather than the market it once was.Inside one wall is stripped down to the bricks and the other they seem to have stopped half way and the only decoration is the fluorescent tube of the name Bukowski along one wall. Tables are for two or four and on a Friday night spill out into Market Row. Lighting is simple and was turned down for more atmosphere as the evening progressed. It was quite noisy so the music being played in the background seemed a little pointless. The menu is short but has flexibility, so when choosing a purist burger you can add Double Gloucester, Stilton (or both) or gherkins, bacon, salsa ….the list goes on. We chose a purist simple Hereford beef patty – which came with oven dried tomatoes, lettuce, gherkins and mayo – a barbecue chicken burger, chicano pulled pork in a bun and a steak sandwich – all of which are described more fulsomely on the menu but we are leaving all that as a surprise. Just for the hell of it we also ordered some extras – chips fried in beef dripping, a Waldorf coleslaw and popcorn crayfish. 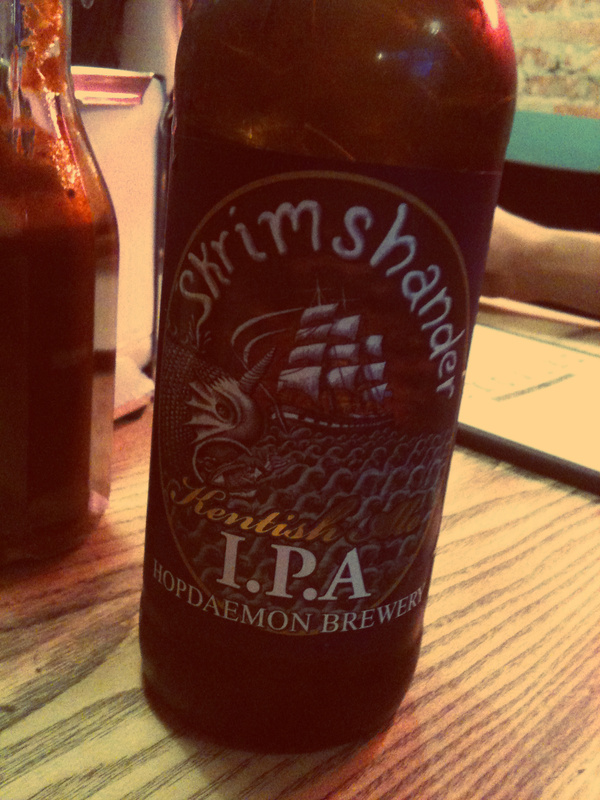 All were washed down with pale ale, lager, iced hibiscus tea and two cocktails. The first was a margarita, which was more of a lemon slush puppy with alcohol. The other was a milkshake with a shot (banana, peanut butter and bourbon) which was smooth and sweet with a kick. 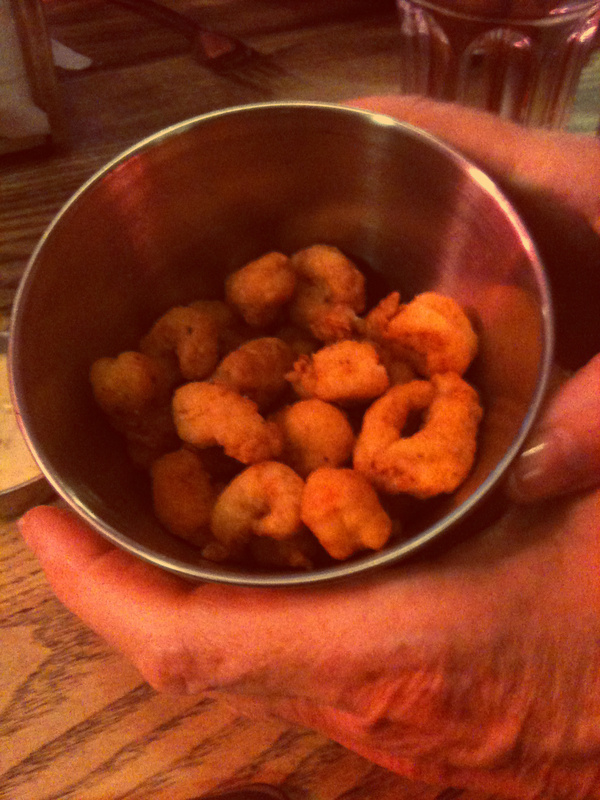 We liked all of the food, especially the crayfish popcorn, which are like a high end version of KFC’s popcorn chicken. Although the bread on the burger disintegrated before it was all finished they do provide knives and forks to help you out. Beware the scotch bonnet relish which is on the table in an unassuming jar and a minute amount can blow your head off. Food is sourced ethically and the meat is from rare breeds in the UK, the cheese from Glastonbury and the beer from a microbrewery in Kent. So not many food miles except for the tomato sauce (homemade from Italian tomatoes) and the gherkins which I think we can forgive. As we mentioned we visited not long after opening time but you cannot tell with the whole place running smoothly especially thanks to our waitress who was especially friendly and had an excellent memory. The cost for all the food and drink was £56.25 which they had in cash because the credit card system will only be working next week. Taking into account several drinks and extra sides the cost isn’t too much considering the quality of the food. Excellent food and great service! Not keen on chips in general but the ones there are the best ones I have ever had! Pork ribs are fantastic and the steak sandwich is top! Another fab plce at the village! 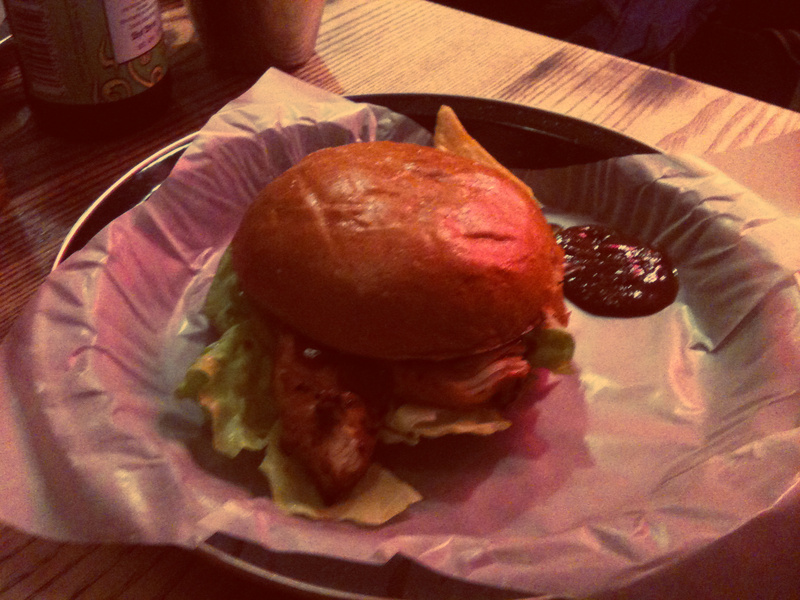 Very good burger, the steak-sandwich was top notch and so was the (only) bottle of wine available. Top mark for beer and Service( real fast). The burger bread as suggested crumbles. Very happy to have yet a great addition to the Market. We had an excellent burger and good service, as suggested above (but the burger bread crumbled a bit as stated in the review) . We also had a VERY good bottle of Red. The chips are very GOOD and the steak sandwich was the best I had tried (by a mile and a bit). It is amazing that we get this kind of food in Brixton and at very reasonable prices. The Market is getting stronger and stronger: a monument to Franco Manca and the other pioneers (Rosie, Bridget Ugo etc.) is long overdue.